Disclosure: I received promotional items in exchange for coverage. All opinions are my own. Hey, every PONY!!! Grace and I are so excited My Little Pony: The Movie hits the theater this week on October 6, 2017! I loved My Little Pony as a girl and I totally enjoyed sharing that with Isabella when she was younger. Now Grace is at the perfect age to play with all the My Little Ponies we've collected over the years and we're excited to see the movie together! In this new BIG SCREEN movie a new dark force threatens Ponyville, and the Mane 6 – Twilight Sparkle, Applejack, Rainbow Dash, Pinkie Pie, Fluttershy, and Rarity – embark on an unforgettable journey beyond Equestria where they meet new friends and exciting challenges on a quest to use the magic of friendship to save their home. Friendship is always magic when the Ponies are in involved! 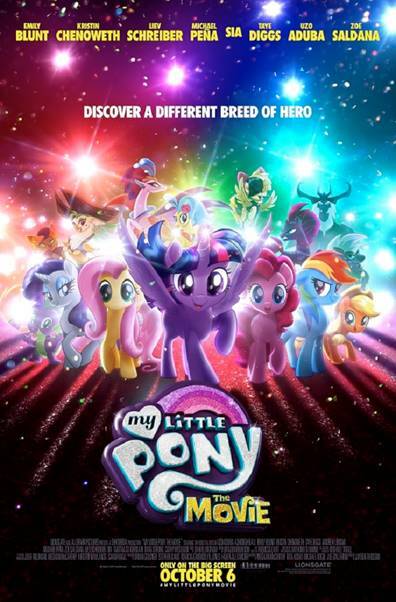 I'm excited that the movie has the voice talent of Kristin Chenoweth as Princess Skystar, Taye Diggs as Capper, Zoe Saldana as Captain Celaeno, and Emily Blunt as Tempest Shadow. Have you watch the official trailer yet? Check it out and then enter my giveaway below! To celebrate this week's upcoming release of My Little Pony: The Movie I'm hosting a giveaway!!! One lucky winner will get a My Little Pony prize pack that include an activity book, a compact comb/mirror, temporary tattoos, ROE pass to see the film (good for 2), and a bag with a surprise pony inside! Use the Rafflecopter widget below to enter! Good luck! My girls love Rainbow Dash. Apple Jack is my niece's favorite! I'm going to have to say Rainbow Dash is my favorite. My daughter and I both like Pinkie Pie! She's so cute! I love pinkie pie, my girls love Rainbow dash. My favorite charters are the misunderstood Stonebacks. All they want to do is make friends with the Bushbobs but they can't comu I care except with grunts and snorts. I could relate after my stroke and I had aphasia. Took awhile to learn to talk again.